I found fresh wild caught flounder at the market the other day. My plan was to go home and make tacos. I knew I wanted something lightly spiced with garlic and herbs. What I didn’t expect was the flavor and texture of this fish to be astoundingly delightful. Once I tried a taste I knew this would be a great fish for salad and I gave up on the taco idea. I dusted the flounder lightly with flour, added a little salt and pepper and pan cooked it in hot olive oil. Once the flounder was cooked, using the same pan, I added chopped garlic, cilantro, a squeeze of lemon juice and a sprinkling of pimentón de la vera (sweet smoked paprika). Topping the flounder with these crispy spicy bits was simply delectable. The flounder was served on a bed of mixed wild greens, topped with grated purple cabbage, tzatziki, cilantro sprigs and a few lime slices. I made the tzatziki before starting the fish. I highly recommend using this in place of a salad dressing. Wash the flounder and pat it dry with paper towels. Set a large skillet over medium high heat and add 3 tablespoons of olive oil. Dust both sides with flour. Set the fish in the skillet, sprinkle with salt and pepper and cook for 3-5 minutes until golden. Turn the fish and sprinkle the other side with salt and pepper. Continue to cook until golden and crisp around the edges. Remove the fish from the pan to clean paper towels. Turn the heat to low and add cilantro and garlic to the skillet. Mix around and when it has become aromatic add the lemon juice and allow it to bubble a little. Sprinkle the smoked paprika, move around with a spatula until well combined and a bit crispy. Turn off heat. Plate each serving. First a handful of mixed greens, fish, crispy/spicy bits, a little grated purple cabbage, tzaziki, cilantro sprig and a few lime slices. Lovely looking fish salad that must have been delicious. Nice picture. This is a great, fresh new idea. Thanks for sharing. 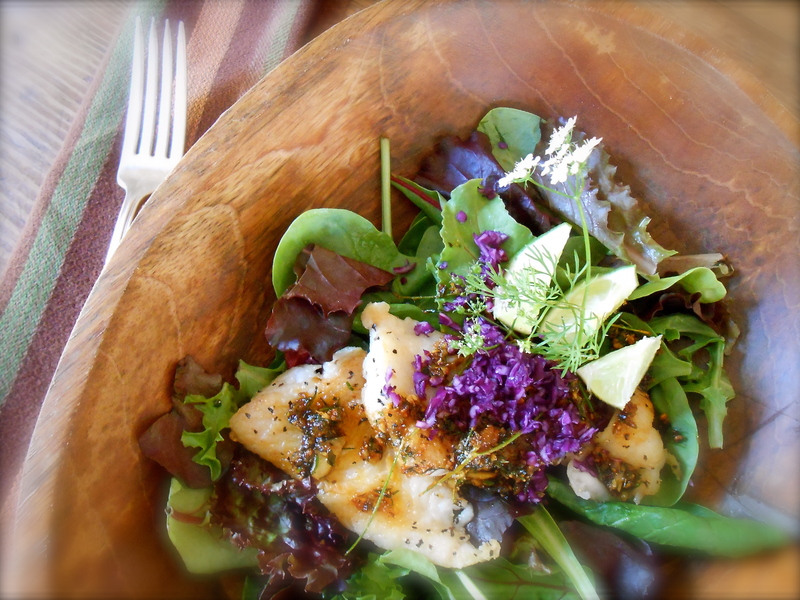 I’ve never thought of a fish salad before – chicken & beef yes, but fish is so novel! thanks for the idea Seana! How’s Jerusalem coming along? Hi there! Well, I have yet to get over to the bookstore. The errand has made it to the top of my never ending list but, everyday it seems like it gets bumped down a few notches. :) Have a good weekend Felicia! Flounder is my favorite fish. What a lovely salad. Flounder is my favorite fish, I love it and love your salad. The spicy crispy bits sound wonderful and the tzatziki is perfect. I have been meaning to get some flounder and will be making this. Will report back. Great! This was the first time I made flounder. I usually stick to the thicker white fish, especially for tacos, so I was really glad I bought it because now I love it too. Hope you do make it. It’s so good. Also, I didn’t buy enough! I only bought 1.5 pound (for 3 of us) and we still wanted more at the end. I really love sweet smoked paprika too. I agree, I have yet to dislike anything I have used it on. Never would have thought to use flounder in a salad. I bet it’s wonderful. I’ve a recipe coming up using baccalà (salted cod) and though it’s often served Christmas Eve, I like to serve it for lunch/dinner on hot Summer days. I bet your dish would be every bit as good, if not better, on those days when the less time spent in the kitchen, the better. Sound really good. I’ll keep my eye out for your post! This was the first time I had fish in a salad and yes indeed it was very good. I really agree with you about simple cooking. Thank you so much for your kind compliments. What a beautiful salad. Flounder is one of my favorite fish and your recipe sounds wonderful. Looks pretty tasty. Do you use a lens baby? That looks too beautiful to eat! I’m sure it was just perfectly delicious!! Salads really are the perfect meal in this heat! You’ve inspired me to cook up some flounder for a salad this week! First time I ever had flounder and I really like how it cooked so quickly. Very nice in a salad indeed. Lovely recipe. I’m always looking for good fish salad ideas and the flounder with tzaziki sounds like a perfect combination. You are currently reading flounder salad at COTTAGE GROVE HOUSE.